SunButter No Sugar Added is simply roasted sunflower seeds and a bit of salt (only 130 milligrams in 2 tablespoons). 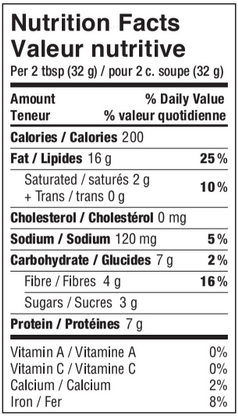 SunButter has 7 grams of protein per serving and more vitamins and minerals than nut butter. 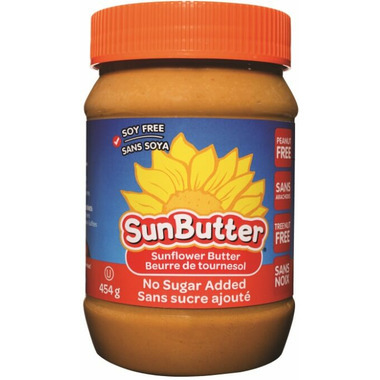 SunButter provides 45% of the US recommended daily allowance for Vitamin E with no trans fat and less saturated fat than the leading brand of almond butter. Oil separation occurs naturally. Stir before use. Ingredients: Roasted Sunflower seed, salt. Processed in a facility free from the top 8 allergens. I love this product! PB upsets my stomach and natural almond butter is too oily/water for my liking. This has a thick creamy consistency and tastes awesome!